Simultaneously retro and creepy looking, these 8-bit buildable sprites of the Five Nights at Freddy's characters deliver! As seen in the "Mini Games" hidden throughout the video game series, fans playing as these 8-bit characters reveal more of the dark backstory of the haunted Freddy Fazbear's Pizzeria! 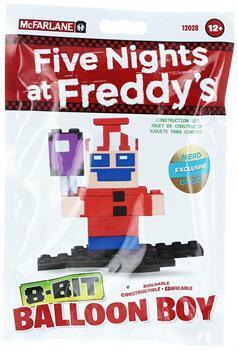 Balloon Boy is a Nerd Block exclusive! Simultaneously retro and creepy looking, these 8-bit buildable sprites of the Five Nights at Freddy's characters deliver! As seen in the "Mini Games" hidden throughout the video game series! Balloon Boy is a Nerd Block exclusive!